Used in over 200 countries and territories by 250 million monthly unique users (of 500 million total users), LinkedIn is the world’s most popular professional social network. Having a business page, and tracking its performance with a LinkedIn Pages dashboard, allows you to tailor your content perfectly to your target audience! Create your LinkedIn Page dashboard today! This historic widget shows how many times people clicked on your content. This historic widget shows how many total social interactions your content received. Social interactions can be anything from post likes, shares, or comments. 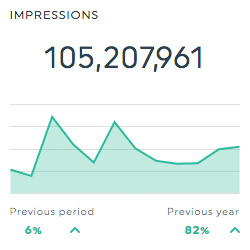 This historic widget shows the level of engagement that your content receives from your target audience. It is calculated by dividing the number of social interactions by the number of impressions, and multiplying the result by 100. Want to see all our LinkedIn Pages preset widgets? 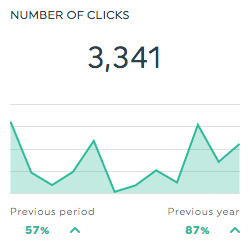 This is the total number of clicks your content received. This is the total number of times people saw your content. This is the total number of comments your content received. This is the percentage of the people that saw your content who interacted with it. It is calculated by dividing the number of social interactions by the number of impressions, and multiplying the result by 100. 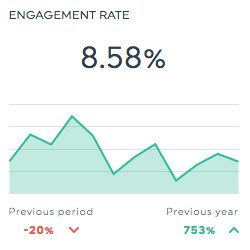 This is the percentage of your followers that saw your content who interacted with it. It is calculated by dividing the number of follower interactions by the number of impressions, and multiplying the result by 100. This is the total number of followers your page has. This is the total number of likes on your page. 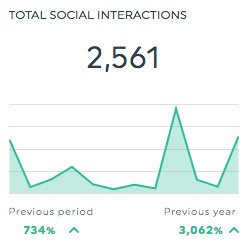 This is the total number of social interactions your content received. Social interactions include everything from likes, shares, and comments. Want to see all our LinkedIn Pages metrics, segments & dimensions? How do I create a dashboard using LinkedIn Pages?